So far we like Bahia Kino. The road to here is hard to find at the moment due to a badly-marked construction detour in Hermosillo, and we apparently just missed a horrible invasion of college students on spring break, but right now Bahia Kino seems worth a visit. 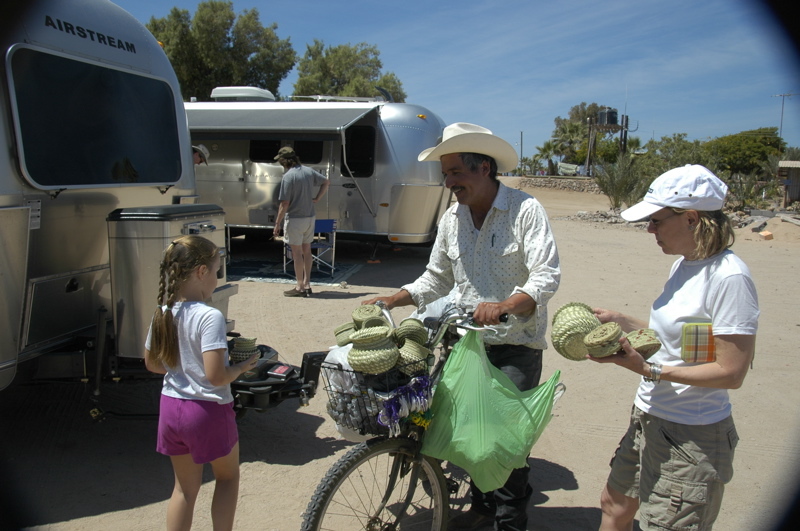 Our campground, the Islandia, is older but has more character than the ones down the strip in “Nuevo Kino.” We are in the old town, on the beach but a short walk from all that Kino has to offer, which is not much. There’s a place for agua purificada, a Super Mercado, a Telcel outlet, a Pemex station (fuel), a park, a bakery, and a sidewalk bar that sells frozen treats. The campground is landscaped with palm trees and little bushes, with birds twittering and the sound of the sea surf just a couple hundred feet away from our campsites. We found three sites together in the center of the park and cobbled together enough of the services to get all of us hooked up. For the three of us there are two 30-amp electrical outlets, 2 water spouts from which extremely low pressure water dribbles out, and three sewer holes. There are also a couple of 15-amp outlets but our electrical testers revealed an open ground on those, so we’ve piggybacked David & Ari’s trailer onto ours instead. We haven’t bothered to connect to the water, favoring our fresh water tanks instead, and are using the outdoor showers a short distance away. The campground doesn’t seem to advertise wi-fi, but it is here anyway, and it works inside the Airstream. (However, I can only receive email — I can’t send, at least not yet.) For all this, we are paying $18 per night, relatively cheap. It doesn’t take long after arriving for the vendors to show up. The first guy on a bicycle was selling handwoven baskets made by native Indians. He was pretty successful, selling both Eleanor and Susan a couple of baskets at about $4-8 each. After getting settled in our first task was to get pesos and fuel. The ATM machine will give up to 3,000 pesos at a time, and since virtually everything here is cash only, including fuel, I went for the max. Filling up the Armada swallowed over 600 pesos right away. We wandered the quiet, dusty streets of Kino for a while, just to see what there was. Ari and I headed over to the Telcel store to get my pre-pay phone activated. It turns out that it was already set, except that calling to the USA was blocked. To get it unblocked, I had to provide my name, address, and age — for reasons unknown to all. Without Ari as translator I would have never gotten it done. I don’t plan to make any calls to the US except in case of emergency, since the cost is roughly US$2 per minute. I believe that incoming callers would see a nasty surcharge on their bill, too. The best way to call home is to use a calling card from a pay phone, or to drop in on one of the streetfront telephone stores which offer discount rates. Given that we have good Internet in the park, I could also use Skype. The bakery downtown was a nice find. 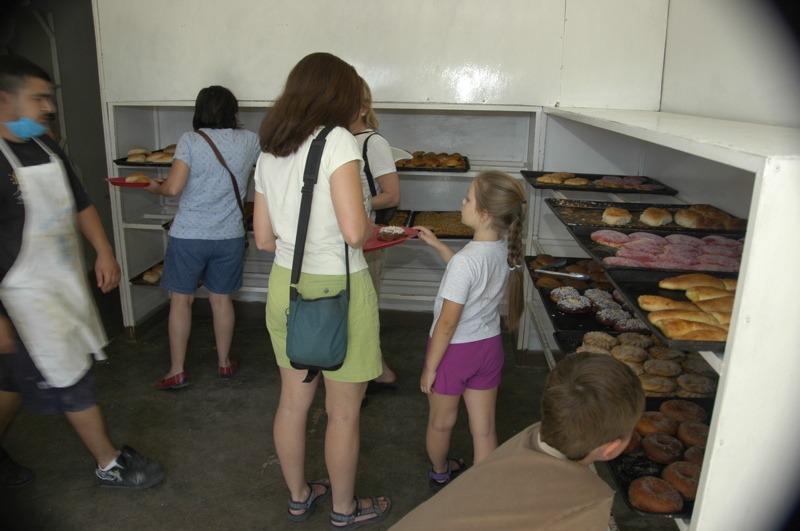 We always have a soft spot for fresh baked goods. We picked out a few goodies and then across the street Eleanor and David were enticed by a guy selling fresh scallops out of the trunk of his car. In the USA this would be bad news, but here it’s pretty typical. The scallops had been harvested this morning. We bought a kilo (2.2 lbs) for dinner. The seller also insisted that Eleanor and David try a raw scallop, which was perhaps not the wisest thing to do, but to be polite they both nibbled the scallop and pronounced it delicious. I snapped a picture of David trying the scallop which I was going to entitle, “The moment you got sick,” but fortunately he didn’t. Buying fresh stuff is fun and easy here. 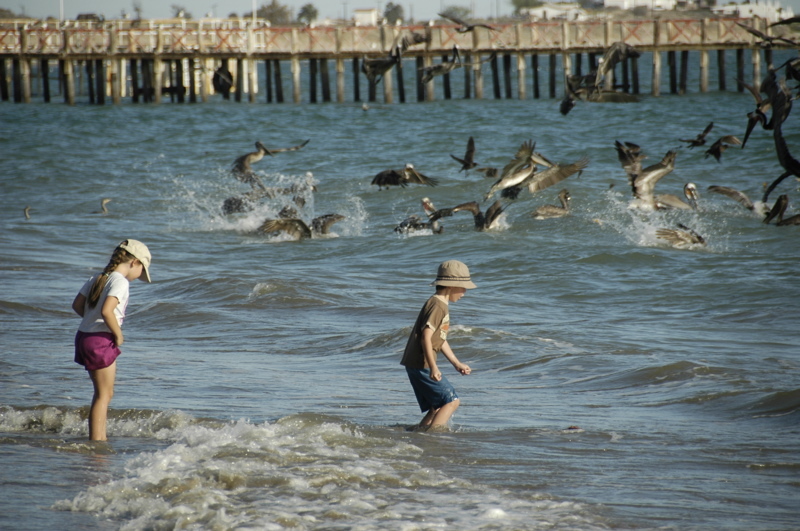 Wandering down the beach, Eleanor and Ari found that the fisherman had just come in with lots of some unidentified fish. 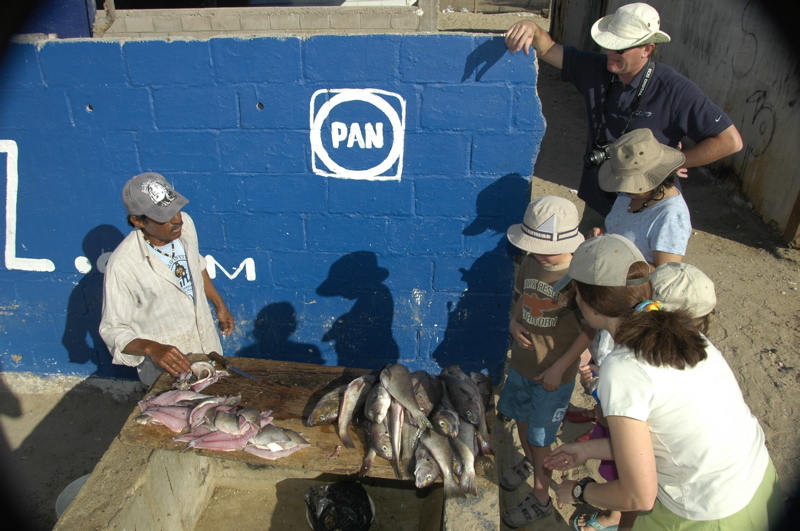 Not knowing what it was, they brought the kids over to see the process of fish being filet’d, and bought a bunch of that too. So the kids had “something fish” for dinner, and we had scallops with a sauce Eleanor whipped up, and everyone had squash with onions, and treats from the bakery for dessert. Our presence seems to be attracting curious passers-by, or perhaps people are just friendly. We’ve been visited by a vacationing 4th grade teacher from Santa Fe, an old lady collecting cans (she sat down with us and had a long conversation in Spanish with Ari), and a couple of vendors. Everyone, including people we randomly encountered in town, has been enormously friendly and pleasant. They are all town boosters, assuring us that there is no point in going on to San Carlos (because the beach is rocky there), and that everything we could possibly want is in Bahia Kino. They are winning us over, because we are already unwinding and settling in. It looks like the group may vote to stay here all week, just walking the beach and watching the pelicans, and relaxing under the awnings with a book. Our departure from Tucson was dramatic. We cleared the driveway and street in front of our house of all vehicles except the two Airstreams, then parked Adam & Susan’s motorhome to the right, and David & Ariadna’s Safari 28 slide-out (identical to Bert & Janie’s) to the left. It’s a good thing we have great neighbors who not only tolerated us but actually got a kick out of it. The “loose caravan” style worked well for our drive down to Nogales, 79 miles away. Crossing the border was a non-event, as it was the last time we entered Mexico. They use a red/green light system, and once again we got the green light, which means “drive on through.” The downtown border station is narrow and riddled with speedbumps so that you can only creep through at 5 MPH for a couple hundred yards. After that, we navigated the gauntlet of Nogales, dodging double-parked cars, slamming on the brakes for various obstacles (people, motorcycles, potholes), and hoping fervently that we made it through the town without any new scratches. Once out of Nogales the drive is easy, even pleasant, and very scenic at times. We hung together, communicating by walkie-talkie, just because we weren’t sure where we’d stop. Highway 15 is a four-lane divided route, but the roughness of it meant that most of the time we were unable to match the posted 100 kph (62 MPH) speed limit. Only toward Hermosillo did the road smooth out, but by then it was getting late and so we decided to stop here rather than press on to Bahia Kino. Our total trip time: 6.5 hours, including innumerable bathroom stops for the kids, border crossing, fuel stop, one organizational meeting, and one wrong turn. That’s a lot of time to go about 250 miles, by US Interstate standards. A tip for those coming down for the first time: bring lots of cash. The Pemex stations did not accept credit cards and ATM machines (el cajero automatico) were nowhere to be found. Also, to get to Hermosillo we passed through two tollbooths (cuotas) which totaled 156 pesos (about US$15). The campground here in Hermosillo also accepts only cash (US$20), so I ran through about US$100 in no time at all. Tomorrow I’ll find an ATM and get a pile of pesos out. Tonight all three Airstreams are parked in a small (10-site) campground just off Rt 15 in Hermosillo. We can hear the highway, but the sites are modern, the utilities work just fine, and the wi-fi works. For $20 we’re all satisfied with it. It looks like wi-fi will be the salvation of this blog. It’s very common in campgrounds here, probably because Americans really like it. It certainly gets my attention when the campground says “wi-fi”, even though I’m accustomed to it not working in the US campgrounds. Tomorrow we’ll head about 70 miles over to Bahia Kino and if we have wi-fi there, the blog will get updated. We have gone through a procedure familiar to many an RV owner. The trailer has been cleaned thoroughly, the propane tanks are filled, the food is stocked. I lubed the hitch, filled the fresh water tank, checked the lug nut torque, and checked the tire pressure. Eleanor pared down our unneeded supplies, re-packed, and re-organized everything. We’ve checked in with the neighbors and put out the trash. A hundred details have been attended to. And now we are ready. All the preparation is good but of course it is no guarantee that we will not encounter adverse events as we strike out. It wouldn’t be an adventure if it were entirely controlled, programmed, and guaranteed. We have set things in place and from here on in we have to put our faith in our Airstream and ourselves. Marlin: How do you know? How do you know something bad isn’t gonna happen? This marks the end of the house blog, and the return of the full-time traveling blog. Aside from a short stopover in Tucson about a week from now, we expect to be on the road for about six months. We have stops planned in NM, TX, LA, FL, NC, VA, VT, NY, ME, OH, CO, UT, and AZ again … and those are only the ones we are sure about. SC, MD, MA, KS, and SD are on the “possible” list. As enticing the possibilities are of this next phase of our travels, they were put in perspective today by Bert & Janie’s tales of their adventures in Alaska. Ten years ago, they spent about a year in northern Alaska, living in a wall tent, exploring the Yukon River by jon boat, and living with the natives. At one point, they spent a month walking north into the Arctic National Wildlife Refuge from Venetie to Kaktovik, about 200 miles over the Brooks Range, only to find their pre-arranged ride wasn’t going to show up. They walked another 15 miles to the nearest village, completely out of food. Bert got two ducks with the last shot in his shotgun as they were walking, thus averting a near-disaster. Their year in Alaska resulted in dozens of printed magazine articles authored by Bert. They are amazingly humble for all the incredible things they have done. Whenever I think we are taking on too much, I look at what Bert & Janie have done. By comparison, our trip is just a fun little jaunt, 300 miles south to the beach. We sure won’t run out of food and resort to hunting ducks. I think all we’d find would be pigeons and hummingbirds anyway. For the next week blog entries will be sporadic. I will write every day but my ability to get online and post from Mexico may be spotty. When I can, I’ll upload and backfill all the daily entries. If anyone needs us this week, leave a message. We’re outta here. It is a good kind of crazy here. Our house is filled with people coming and going, talking incessantly, doing laundry, re-heating pizza, reading books, and planning dream adventures. Our schedules are random and constantly changing. I never know who will be in the driveway from hour to hour. It’s like days in the college dormitory. Having Adam and Susan, and Janie and Bert here is dangerous. They are all full of ideas of places we might go, and schemes for making exotic trips possible. We’re talking about the Yucatan Peninsula, South Africa, and Australia. The dangerous part is not the destination, but the fact that our friends might actually pull off these trips with us coming along. I know we’d love to do some overseas traveling if we could figure out how. We have been notified that our last portion of kitchen countertops will be installed on Saturday, exactly 24 hours before we leave. Talk about cutting it close to the wire. Actually it’s far too late, because now we can’t get the final paint touchups and appliance installations done. We plan to take a couple of days after Mexico to finalize what we can, and that will be it for this season. I think at this point we are already mentally checked out of the house-renovation process. It would have been nice to have had it all done a month ago, but since it wasn’t we’ve turned our attention to other things. The contractors and projects have been superseded by other suburban tasks, and soon this entire phase will fade away to a memory as we rejoin our lives as travelers. For all the aggravation of renovating the house, I don’t regret it. We have what we set out for: a safe, reliable, easily-maintained home base in a nice climate. Our investment of time and money means it will be here to support us when we get back, or whenever we need it. We know we’ll be comfortable here, and the door will always unlock for us. It is not perfect but it will be home whenever the Airstream isn’t. For most people, that’s the ordinary situation but for us it’s a novelty. I have a checklist of things we must do before we go. The list has dwindled by half since Monday, but the rest will have to be tackled in the next 36 hours. That means Saturday will be one more crazy day, as we move back into the Airstream and mothball the house, while overseeing the countertop installation and helping our guests stay busy with their own activities (sightseeing, etc). It’s a lot of effort but fun at the same time. I guess I prefer this sort of crazy to being sane and stable all the time. 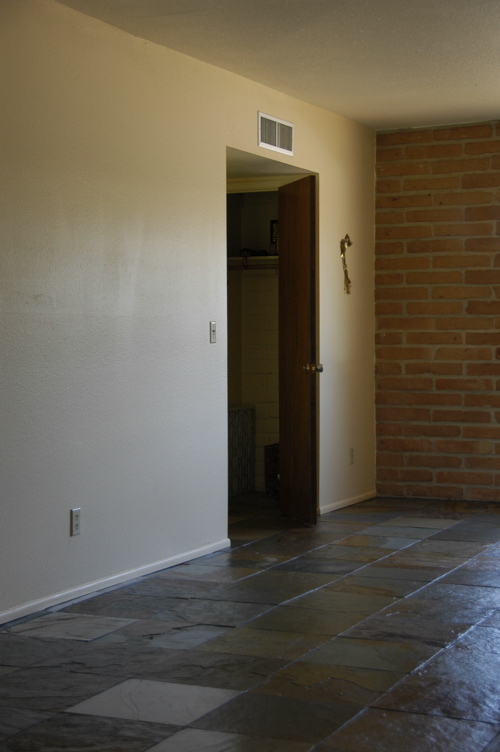 For the past month I’ve been opening the windows in the house to let the afternoon air seep in and warm up the cold stone floors and adobe blocks of the house. 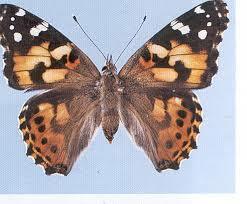 In February and early March there are so few insects in the air that not having screens was never a problem. Once in a while a fly would buzz in, look around, and buzz out again. But now the desert is warming and the flowers are blooming. Bees are examining the blue flowers on the rosemary bushes, and the occasional “mosquito eater” wanders in and stays out of confusion. Last night Eleanor trapped a beautiful Painted Lady butterfly who was stuck in a ceiling light, and released it after Emma identified it in her butterfly book. Our days are now consistently in the 80s and the nights are in the mid-50s, so the house is at last a comfortable 71 degrees throughout. This means we can start to leave windows open at night, too, to moderate the thermal mass of the house and keep the house from getting too warm. I put in the window screens and thought, not for the first time, that it would be nice to stay just another few weeks to enjoy the very best of Tucson’s weather. But that won’t happen. We are still committed to our departure on Sunday, because we’ve got far too many things to do this spring and many people we want to visit. So this morning I pulled the Airstream out of the carport past our temporary tenants (the Gildarts) and across town to the local Airstream dealer. I left it there to have the heat pump fixed, and four hours later I got a call that it was done. The problem turned out to be a bad circuit board. Dometic is replacing the board under warranty, but we have to pay for the labor. That’s $200 to us. In the big scheme of overall maintenance it’s not a big deal. It has to cost something to stay on the road, and our annual expense has been about $2000, counting all repairs and scheduled maintenance. So far this year we have spent about $350, which for three months is not bad at all, but it’s reflective of the fact that we haven’t traveled much. Being separated from the Airstream, even for a day, has been tougher than we expected. We took out all the daily things we thought we’d need, but then all day we were looking for items that inevitably turned out to still be in the trailer: a notepad, a particular knife, and birthday candles. Friday morning I’ll go over and bring our first home back to our second home. It’s clear we can’t be separated from the Airstream for long. The birthday candles were of course for Eleanor, whose birthday snuck up on us in the confusion of house projects, trying to get back on the road, and people coming and going. But it turned out for the best, since Adam and Susan arrived and with Bert and Janie it meant we had four of our best friends on hand for a party. It was just a wonderfully lucky coincidence. Emma and I made a card using some of the techniques taught to Emma by our friend Lou in Ohio. It featured a palm tree and a “slider” of a monkey, swinging from limb to limb. Eleanor got two bouquets of flowers, a bunch of kettle corn (not from me, even though I love the stuff), and a white chocolate/raspberry birthday cake. Bert & Janie bought pizza for everyone and we just hung out in the dining room and told stories of past adventures and past lives. 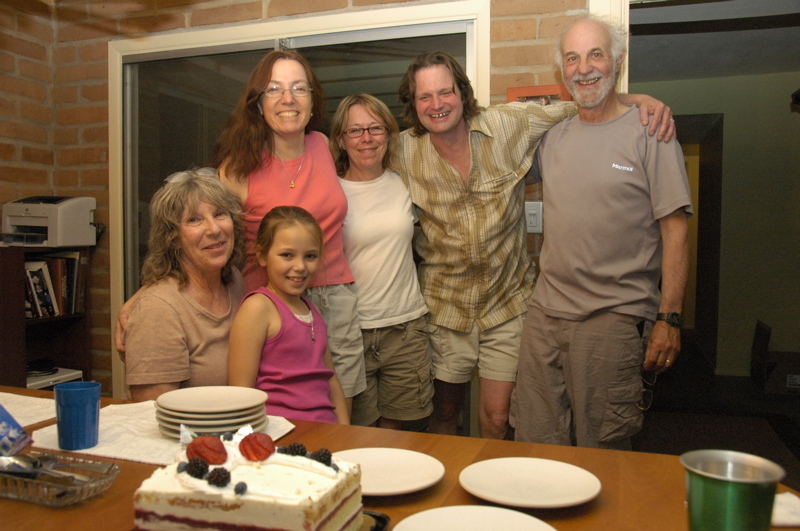 It was a good birthday party on a wonderful desert day in Tucson, in the middle of a great week. We’ll look back on this day and remember it not for the money that the heat pump cost us, and not for the things in the house that still aren’t right, but for the people who made it a great day by traveling hundreds or thousands of miles just to share it with us. We’re down to the home stretch. This Sunday, we leave, whether the house is done or not. Every day we tackle lists of things that both the house and the Airstream need, and we try not to think about how much more there is to do. We’ve made this harder for ourselves than it had to be, strictly speaking. We didn’t have to thoroughly remove everything from the Airstream, clean, sort, and then re-load, but we wanted to. We won’t have another chance to do this for at least six months. So Eleanor has been taking the time to clean those things that have been bugging her, like the aluminum kitchen blinds. Those blinds sit right by the stove and they get dusty and greasy. It turns out that if you try to clean those blinds in place, they tend to get bent and creased. The better way to go is to take them out entirely and soak them in the tub, which is what Eleanor did, among many other tasks inside the Airstream. I have mostly been doing stuff in the house. The big job was to finish sealing the slate floors in the dining room and living room. We used a matte sealant but when they are first done the effect is very glossy. It will eventually calm down, so I took a picture to remember how it looked. I also took the little Honda out to have its windows tinted, in preparation for life in Arizona. Even though it will sit in the carport all summer, the tint is nice to have for Arizona’s intense spring and fall sunlight. We are already entering the warm season, with mid-80s every day. Crickets have moved into the house and are chirping merrily away each evening. The first days in the 90s are only a couple of weeks away. There are a thousand lesser things on the list: adding fuel stabilizer to the car, removing things from the backyard that might make good snake homes, turning off the water heater, etc. It’s a lot like the pre-departure checklist we use for the Airstream, but everything is bigger and takes longer. 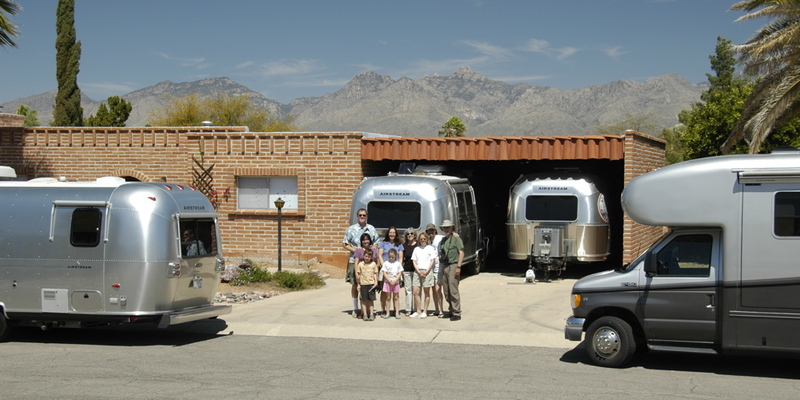 Today our second Airstream guests of the week arrived: Bert & Janie Gildart. They just came out of Organ Pipe Cactus National Monument, and squeezed into the space formerly occupied by the Welshes last month. Bert & Janie have a Safari 28 with slide-out, but there’s no room for the slide right now. They’ll be here a few days, but mostly on their own as we continue to hustle around the house trying to get ready. 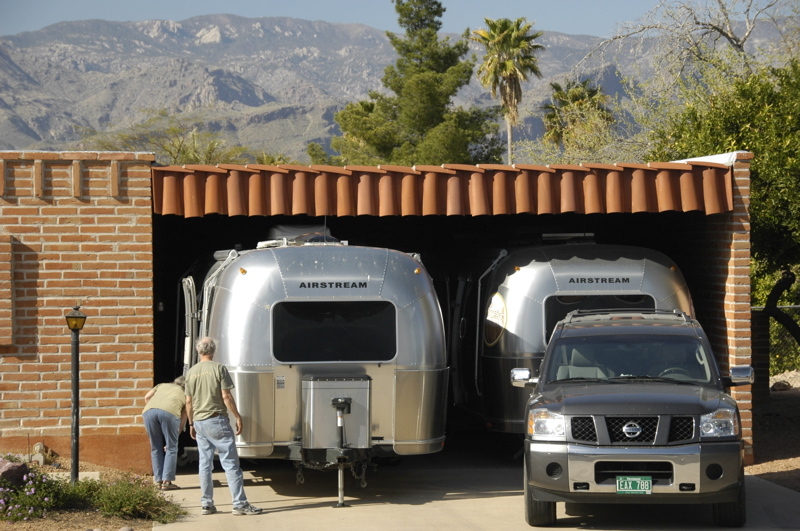 Bert backed the Airstream into the carport exactly in the right spot, on the first attempt. I thought Bobby had done a good job but Bert made it look downright easy. I had to get a picture of the two Airstreams right away, because Thursday morning ours is going over to the local Airstream dealer for service on that non-functional heat pump. Once we are out of the way, Bert will be able to deploy their slide-out. Then we’ll bring our trailer back on Friday night for the last two nights. Susan and Adam called in from Texas and said they’ll be in town on Friday. They are going to park their Airstream Class C down the road at a campground until it’s time to launch the caravan to Mexico on Sunday. I haven’t decided if it will actually be a caravan. 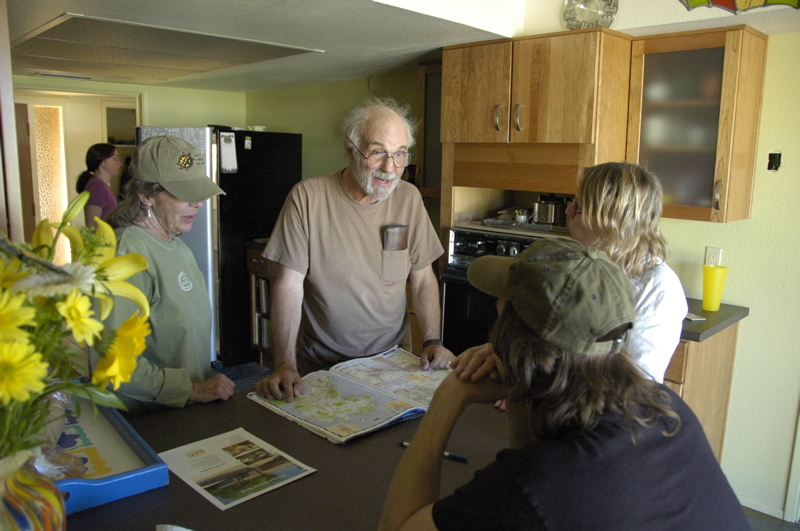 Caravaning implies that we all leave together and travel together, like a trucker’s convoy. I really prefer not to do that. In the past, we’ve traveled very loosely with friends. Our usual mode is to tell everyone where to end up, and let them all travel on their own schedule. That way we are all able to be independent and nobody is chafing because somebody else slept in, or didn’t want to take a bathroom stop, etc. Also, while we would all help each other whenever possible, I don’t want to be responsible for holding someone’s hand every step of the way — it doubles my responsibilities and makes a trip seem like work. So I tell everyone, “You’re on your own. If you have a problem, give a call and we’ll try to help, but no promises. Drive like you are traveling alone, because you probably will be.” Fortunately, all of our friends are pretty independent and self-reliant, and they have no problem with this. They are bright enough to prepare in advance (for example, getting good insurance with English-speaking telephone assistance) and they know how a smile and a few words of the native tongue can work miracles when there’s a problem. Another reason I prefer not to caravan is that it is a nuisance to try to find a place to park three big Airstreams all at once, such as for lunch. One of us can pull over to check out that interesting-looking little taco stand, but with all three we’d probably have to pass it up. In all sorts of situations (getting fuel, stopping for border inspection, checking out a scenic vista), it’s easier if we arrive separately rather than in a bunch. One reason to keep the vehicles together might be that there are more unusual circumstances on the roads in Mexico. For example, I have heard from other Mexican caravanners that the lead vehicle alerts the following ones by CB radio of speed bumps (topes, pronounced “tow-pays”) coming up. But my feeling is that you shouldn’t drive hoping someone in front of you will tell you what to do. Why, after 50,000 miles of towing, would I suddenly stop looking out for myself? Keeping my eyes open and my head focused on the task has helped us avoid a lot of problems so far. This brings up another frequently-asked question: Do we have a CB radio? No, we don’t. If we did more caravaning it would probably be indispensable, but with our type of travel I haven’t yet felt the need. I know lots of people who do have CB radios and they love them for getting reports from truckers and others on the road, so I’m not saying they aren’t useful. But we have two cell phones, mobile Internet, a GPS with a multi-million point database, maps, and the ability to stop and ask questions when we need to. I haven’t felt the need for more. Today I got a huge gift from a blog reader and contributor to Airstream Life. 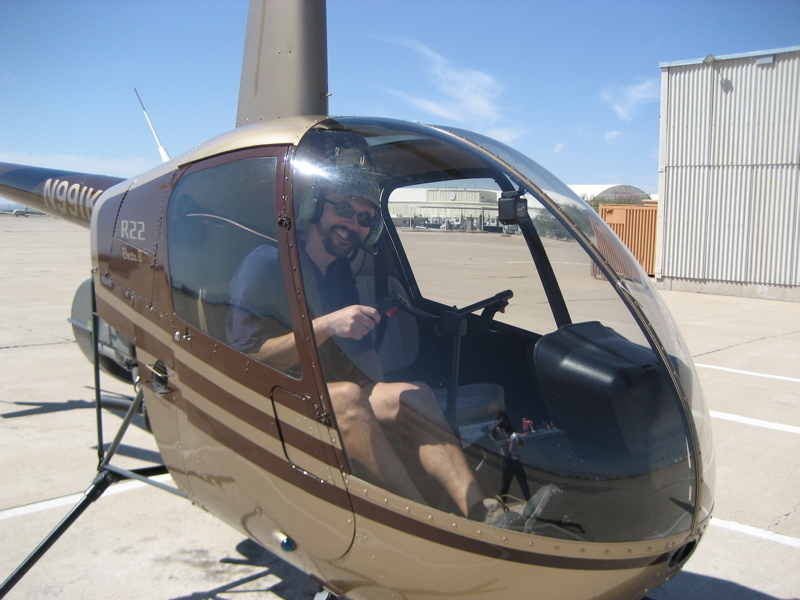 Craig arranged for me to take an hour of flight instruction in a Robinson R-22 helicopter at the Tucson airport. Now I owe him big-time. Those of you who have read the blog for a long time know I love flying … when I’m in one of the front seats. 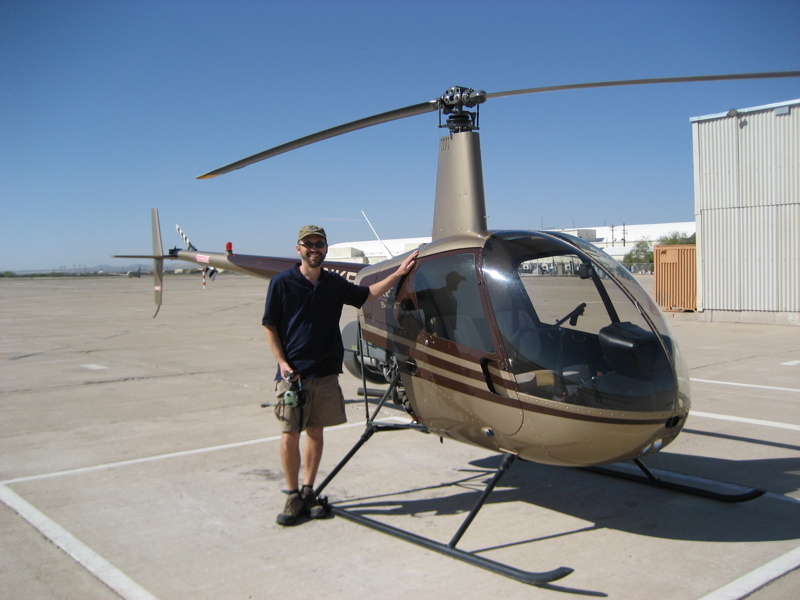 In January 2007 I got my first helicopter experience courtesy of an Airstreamer who works at FlightSafety International in Dallas. I flew the Bell 430 and 212 jet helicopter simulators. That was absolutely amazing, but flying the real thing was exceptionally cool too. The Robinson R-22 is a tiny little helicopter, just big enough for two people to squeeze in (and not very big people, either!) It’s like a sporty little car. From the moment it lifted off the ground it was like magic. So fun it hardly seemed it could be legal. Even a hover at just 6 or 7 feet was thrilling. My instructor was Laura, a superb and natural teacher who seemed to have almost as much fun as me. Our first task was to practice hovering, turning, and tracking in a straight line at an uncontrolled ramp near the flight school. It took a few minutes for me to adjust my brain to the way the cyclic (control) works, during time which we enjoyed some interesting see-sawing hovering. In forward flight things are much easier. 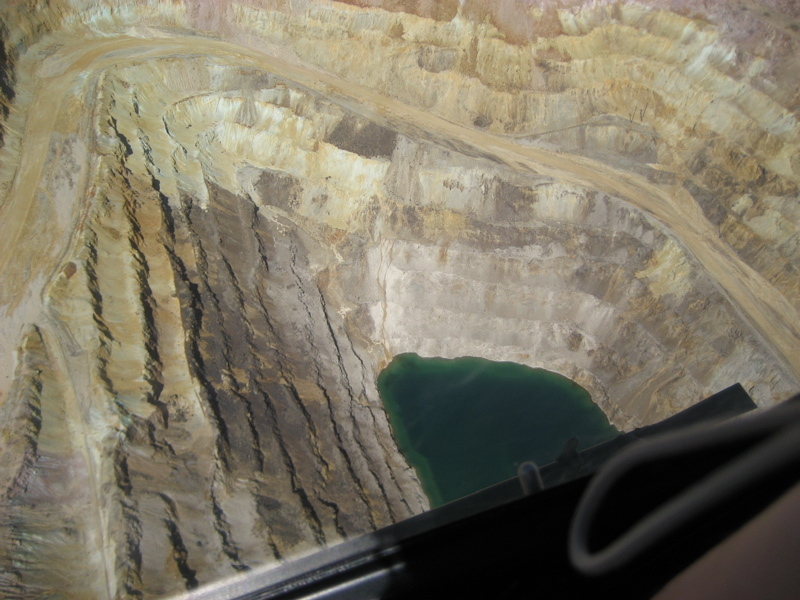 Since I’ve got a few hundred flight hours in fixed-wing aircraft and an Instrument rating, I’m used to “attitude flying,” so Laura was able to enjoy the scenery as we cruised over the ASARCO open pit copper mines to the southeast of Tucson airport. That’s not to say she just turned it over to me completely — she kept a hand on the collective at all times, ready to react if I did something bad, or if we had an unexpected event. Flying the R-22 in warm weather like today’s seems ideal. (It was about 80 degrees with full sun.) There’s no air conditioning, but just by removing the doors we could have kept the interior very comfortable. As it was, I was comfortable in forward flight at 3,700 feet, as long as the bubble windshield wasn’t pointed south. Any sweat on my body was solely due to nervousness. The turbulence wasn’t bad either. It’s smoother in a helicopter than in a small airplane. So would I like to get my heli certificate? You bet. But I’d need to drop about $15,000 to complete the rating, and then of course, I’d need a helicopter once the flight training was done. The little R-22 costs about $120 per hour to run if you can afford the quarter-million to buy it, and between $180-200 per hour to rent. I’ll have to wait. I can only afford one traveling hobby at a time. But wow …. that was fun! Thanks to Craig and to Laura at Voyager Helicopters in Tucson.